Top physio Mike Aunger from our Partners Technique Physiotherapy takes time out from looking after the football stars at Chelsea FC and cyclists at his busy London physiotherapy practice to demonstrate some cycling stretches that will increase flexibility, strengthen joints and prevent cycling over use injuries. Cyclists as a group are very well maintained individuals; but they do get injuries that are typically overuse in nature. So for this post on cycling stretches I will discuss the engine room for cyclists; the quadriceps. It doesn’t take much to appreciate that cyclists work their quadriceps more than any other muscle, take a look at Sir Chris Hoy or Tony Martin, monstrous quadriceps and both men have a trophy cabinet to reflect their more than adequate representation in this department. Obviously, there are other factors involved as to why these men have been so successful. Today though, let’s focus on this muscle group and in particular why I feel as a physiotherapist it is important to look after your engine room. The quadriceps is a two-joint muscle group; they have an affect on both the hip joint and the knee. They are the main extensors of the knee and when a cyclist pushes down on their pedals it is mostly from the action of the quadriceps that power is produced and transferred into the rear wheel. Most cyclists will aim to maintain a cadence of around 80-100 revolutions per minute; that equates to a lot of use over the period of any length of bike ride. The most common problems affecting the quadriceps muscle are associated with it’s distal attachment into the tibia, around the knee cap (patella) and the patella tendon. I often find that cyclists present to me with overloaded knee caps and tendons, related to the hours of training that cycling events require. Following this series of important cycling stretches that will help to keep the quadriceps loose and offset the negative effects of training on the knee cap and patella tendon. Include these cycling stretches in your daily and post workout stretching routine and start to plan how the trophy cabinet will look in six months time. 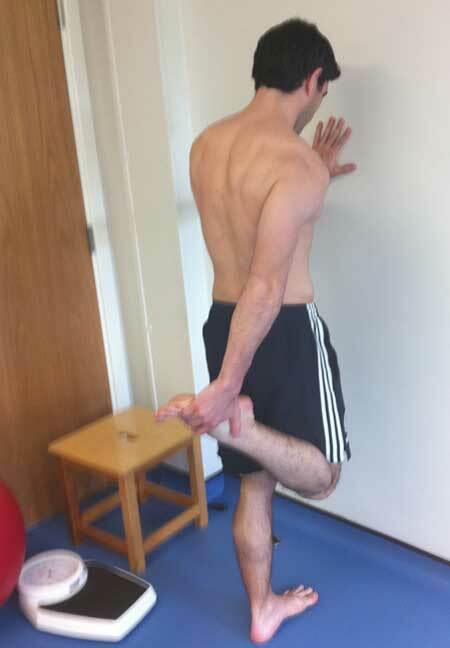 This standard quadriceps stretch should be included before and after every ride. It’s easy to do in any environment so there are no excuses. Simply include this stretch while waiting for the shower at work after your morning cycling commute or at home while you wait for the kettle to boil after a long ride. This is the best stretch for the quadriceps and is best done after a cycle ride or included in a core strength or gym session. 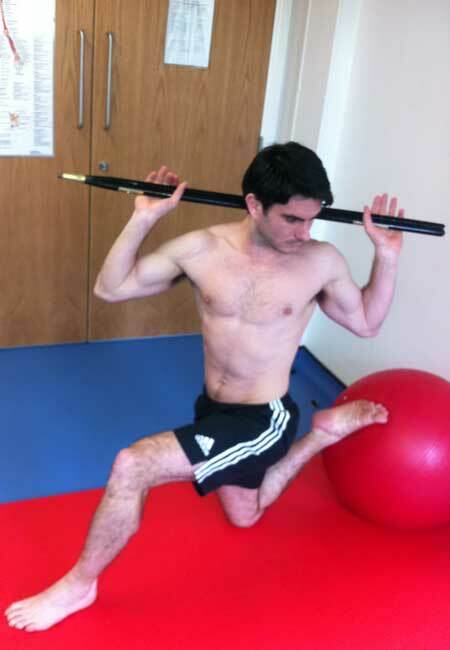 The more advanced quadriceps stretch should only be done once the intermediate stretch can be done comfortably. 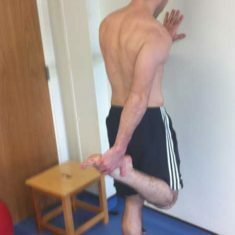 Twist to the opposite side of the leg that you are trailing/stretching. Stretching is a completely cost free way to improve your flexibility, strengthen joints and increase cycling performance – why wouldn’t you do it every day? Our guest author Mike Aunger and the team at Technique Physiotherapy work with their clients to return them to full fitness and then keep them injury free. If you have a niggle or want to learn how to prevent injury and maximize your sports performance then take advantage of our exclusive Brevet offer of 10% off physio treatment. Just quote Brevet when you get in touch and make an appointment at their Wimpole Street practice in the heart of London’s medical district.